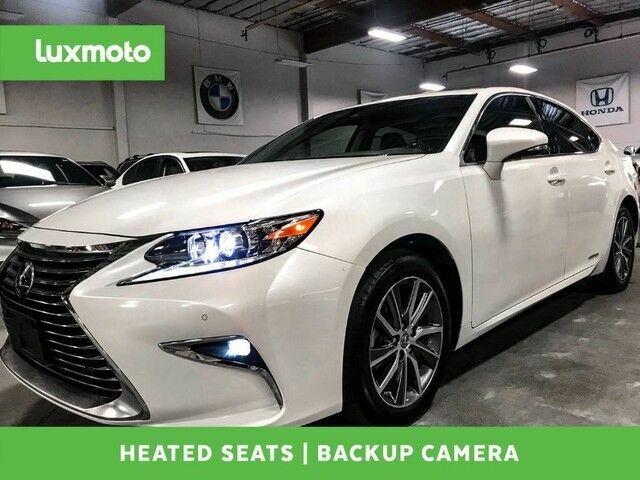 **Carfax Certified 1-OWNER**, **FACTORY WARRANTY**, **CLEAN CARFAX**, Lexus ES 300h Luxury, **NAVIGATION**, **PRE-COLLISION WARNING**, **DYNAMIC CRUISE**, **BLIND SPOT MONITOR**, **BACK UP CAMERA**, **HEATED/COOLED SEATS**, **HEATED STEERING WHEEL**, **SATELLITE & HD RADIO**, **MOON ROOF**, **ENHANCED BLUETOOTH**, **MUSIC STREAMING**, **SMARTPHONE INTEGRATION**, **USB & AUX PORTS**, Lexus Premium AM/FM/DVD/HD Audio System -inc: WMA/MP3 Capability, 5.1 Surround Sound, Power Tilt/Telescoping Steering Wheel w/Auto-Tilt Away, Proximity Key For Doors And Push Button Start, HDD Navigation System w/Advanced Voice Command, Dual Power Front Seats with Lumbar and Drivers Memory, XM NavTraffic/XM NavWeather/XM Sports, iTunes Tagging, DVD Player, Lexus Enform Safety Connect, Xenon HID Headlights with LED Daytime Running Lights, Fog Lamps, Cross Traffic Alert, Rain Sensing Wipers, Dual-Zone Automatic Climate Control and much more. Come take a look at this Captivating ES in our Indoor Showroom. The Lexus ES occupies an important niche within the highly competitive entry-level luxury segment. With its attractive sheetmetal, long list of standard features, and incredible safety technologies the ES earns its high recommendations. While the Lexus is much more comfort-oriented than entries from Cadillac and Mercedes, it does so extremely well, and for a price that starts just under $40,000. The Lexus ES 300h hybrid version provides all the luxury but aims to save fuel with a gasoline/electric powertrain. Lexus and Toyota are credited with essentially inventing the modern hybrid and the ES utilizes that technology to its fullest, earning a combined EPA estimated 40 mpg. Interesting features of this model are hybrid efficiency, Incredible chassis dynamics, V6 power, and terrific interior room and comfort levels.